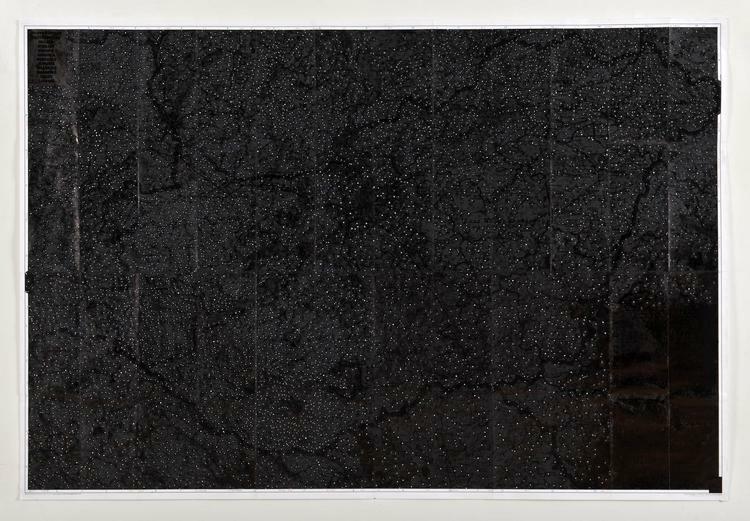 Kathy Prendergast's Black Map series, from which these works are selected, are produced using printed motorist maps almost entirely obscured with ink. Tiny white spots that represent towns, villages, and cities pinpoint places of habitation and, up close, the place names, road numbers, and contour lines peer through the surface. From afar the ink appears opaque and the effect is that of a night sky dappled with strange and unfamiliar constellations. In these works, which depict the Czech Republic and Slovakia, the ink obscures all signs of connection and communication, yet there is a suggestion of solace in the luminosity of the exposed areas. They share a nocturnal and melancholy tone with Josef Sudek's photographs in Gallery 1, particularly those which capture an occupied Prague at night. This exhibition coincides with Atlas, a new installation in the Kerlin Gallery, Dublin, consisting of paintings made using over one hundred copies of the AA Road Atlas of Europe. An Irish artist, based in London, Kathy Prendergast has previously exhibited in the Douglas Hyde Gallery on a number of occasions. She has also shown work widely in Ireland and abroad.